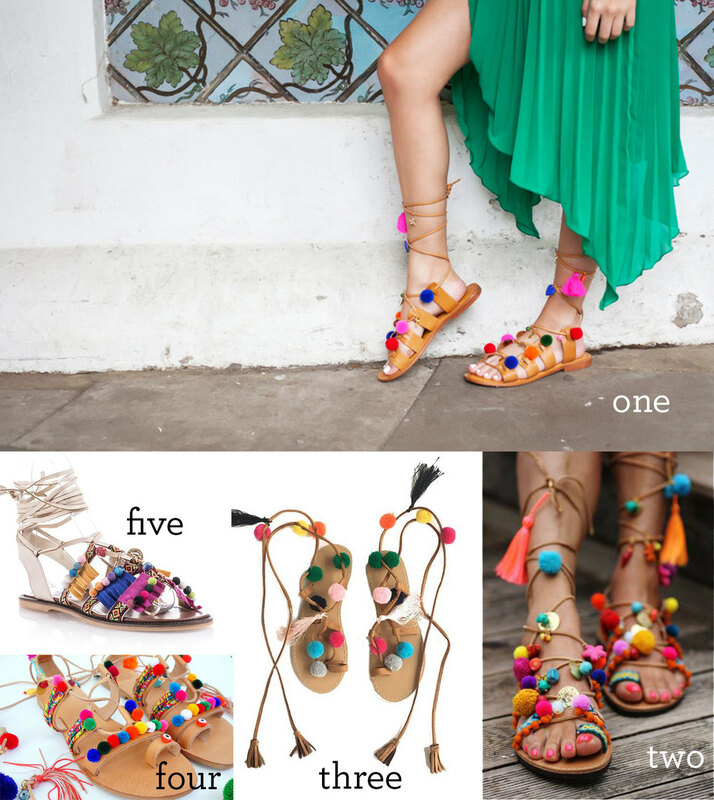 So, my newest obsession for the summer is the pompom sandal. I passed by them at Anthro and it was like my head was yanked away from my body when I spotted them. Laying on the shelf, they looked kinda like a pathetic deflated party balloon... or like the inside of Cheech's Love Machine had been put through a neon-colored blender, and I was fascinated. I kinda hate myself for it, but I'm strangely attracted to them. They're like a wacky Carmen Miranda fiesta for your feet. Did I buy them? No. But, they are still haunting me. For two months. They've been haunting me. I've started seeing them pop up all over the place. In stores, on Instagram... I don't think I've actually seen anyone wearing them out in public, but then again I did not go to Cochella, so they could be EVERYWHERE and I don't know it. I've been living in a little bubble for about 6 months, so there. A quick insta-search reveals that with 5,800+ tags, yes, #pompomsandals, they are everywhere. The more I scroll, the more people start to look something like utterly ludicrous Decorator Crabs grabbing bright, shiny balls and sticking them onto their feet. 1: WhatFrankieDidNext Pompom sandals,. 2: Elina Linardaki Penny Lane Sandals, 3: Good Night Macaroon pom pom lace-ups, 4: Greek Sundals Small pom pom lace-ups, 5: TrendyTopUk Haldidi tufted sandals.